Contemporary methods of the treatment of spine fractures imply a good correction and stable fixation of the fractures. Mainly, it is carried out by the help of transpedicular implants. Generally, they are implanted from posterior open spine access, which leads to some blood loss and formation of a big operating wound. Yet the healing of the wound becomes difficult and lasts longer (post-operative complications are also possible). The development of transpedicular technique has led to the creation and usage of minimally invasive method in treatment of spine fractures. For this purpose are created the special sets of tools and implants, which allow to insert the transpedicular screws through small skin incisions, without damaging muscle and other structures of the organism. A patient G.L. ,51-year-old, was admitted in 26.05.2016 with combined trauma: compression fracture on the L-3 and Th-12, pelvic fracture, left tibia fracture . By the Head of the Spine Pathology and Vertebral Surgery Department Dr. K.G.Momjyan and vertebrologist Dr. K. Hayrapetyan was performed the minimally invasive surgical correction and fixation of the spine fractures: through 6 small incisions are inserted transpedicular screws on the Th-11, L-3 and L-4 vertebrae, from both sides of the same incisions are inserted the stems by which is maximally regained the fractured vertebrae and fixed in correct position. Post-operative period went smoothly and the patient was discharged on the 4th day. Such kind of intervention already had been performed in 8 patients with positive outcome. 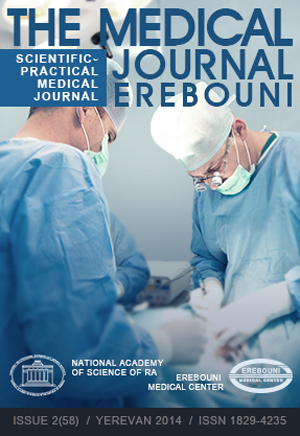 Minimally invasive method for the spine fracture treatment had been performed and successfully implemented for the first time in MC Erebouni. The method allows to patient in early postoperative period recover their usual everyday activity, reduces the wound pain and necessity to take analgesics. It makes also possible not to use wound drainages and other appliances that allows patient early discharge from the hospital without risk of wound infections.